These Dark Chocolate Chunk Cookies are incredibly rich and dark, with melty chocolate chunks and toasted walnuts for crunch. 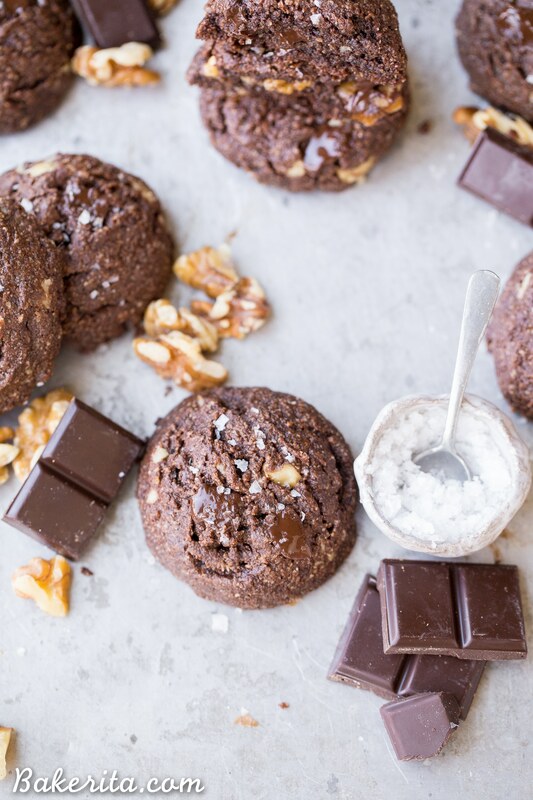 These chewy, fudgy dark chocolate chip cookies are gluten-free, paleo, and vegan, and perfect for the chocolate lover in your life. Alright, if you’re not a chocolate person, this is not the post for you. Because this post is for the people who can never have enough chocolate – the richer, darker, and fudgier it is, the better. I’m definitely one of those people and if you are too, you can be part of my cool kid’s chocolate loving club. We do things like eat lots of double chocolate chunk cookies, maybe even dunked into hot chocolate, and then go on to find and eat some more chocolate. Oh yes, it’s a very delicious club. And as we delve further into cookie season, it’s time to get our favorites in order to make sure that we’re giving and eating the best of the cookie world. For me, these Double Chocolate Chunk Cookies definitely fall into the “best” category. 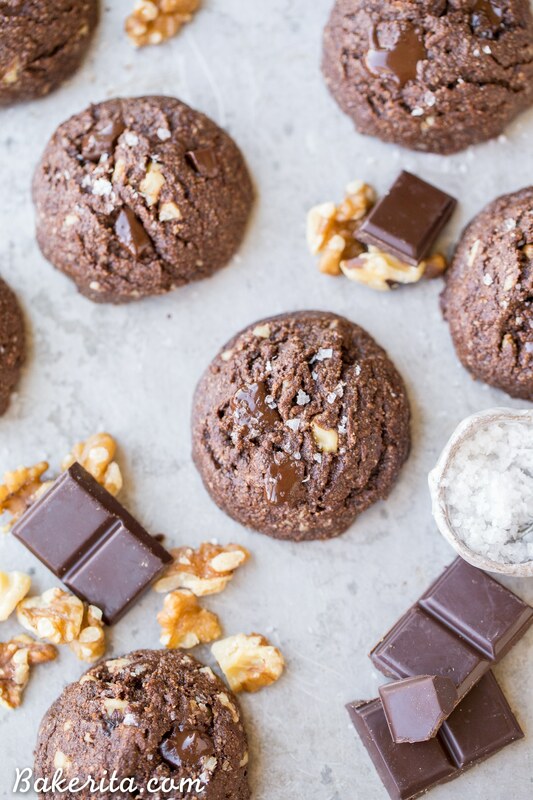 These are a twist on my Paleo Chocolate Chip Cookies, which have been a major favorite of you guys, my family and friends, and of course, myself. They’re pretty damn perfect, as far as my ideal chocolate chip cookie goes, and based on all the rave reviews I receive almost on the daily, most of you who’ve tried it agree with me. These Double Chocolate Chip Cookies are a version of those faves with the chocolate levels amped up a notch. 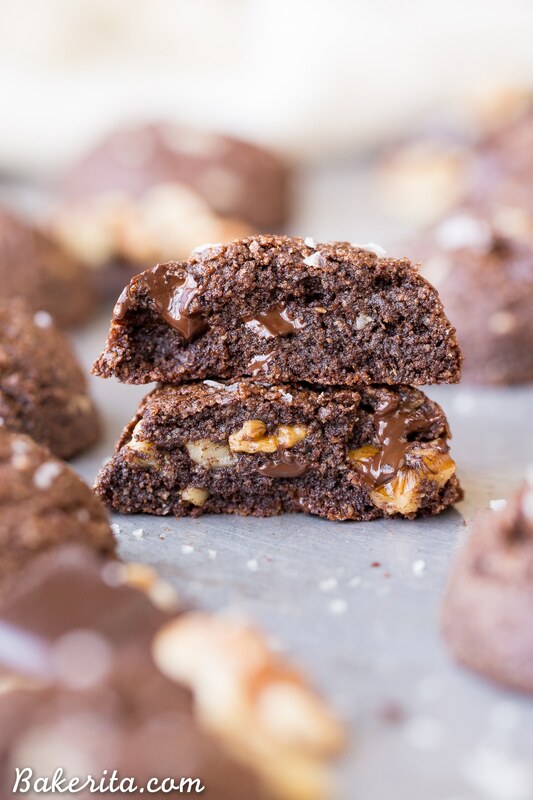 High quality cacao powder replaces some of the almond flour, which creates an ultra fudgy, super chocolatey cookie, especially when paired with big chunks of dark chocolate. 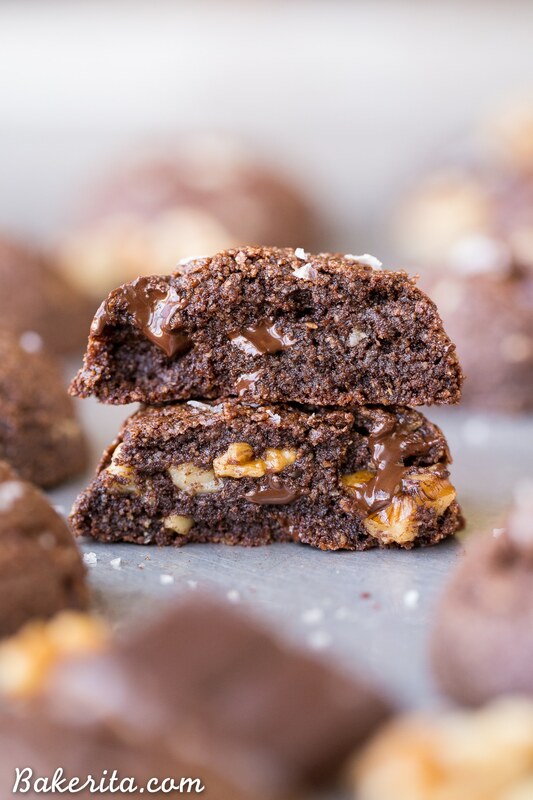 I love almond flour in these cookies, because it adds a nice nutty flavor that adds a little extra something something, and creates a super chewy and delicious texture that replicates traditional all purpose flour pretty damn well. In addition to the chocolate chunks, I added chopped toasted walnuts for a bit of added texture and crunch. I love a bit of nutty crunch in my cookies, but I know there’s those of you out there who are mad at me for even considering adding walnuts to your cookies, so for you, just skip them (and maybe add more chocolate instead). I round them out with a hearty sprinkle of flaky sea salt. If you’ve been around here for a bit, you know I love a bit of saltiness with my sweets, especially when chocolate is involved. If you’re not a fan of salty/sweet, leave it off, but I recommend giving it a try before writing it off entirely – the salt really does add something special here. 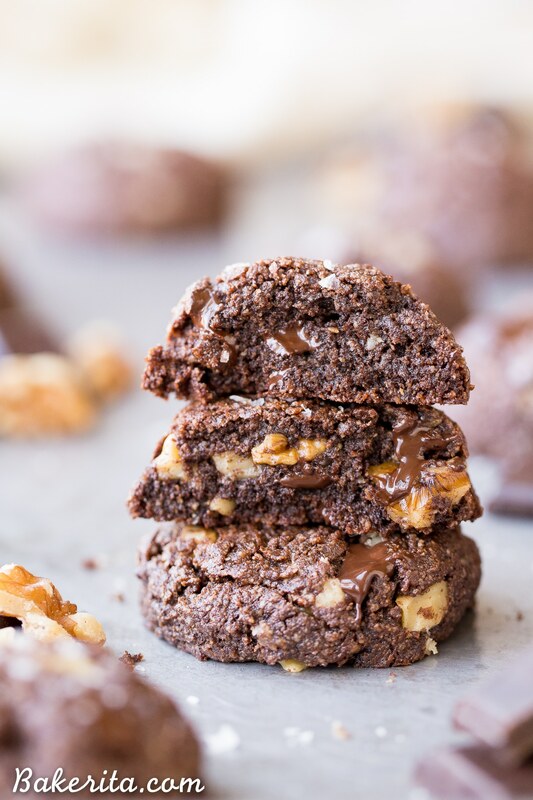 So, my chocolate loving friend, I hope you’ll gather your ingredients and get yourself into the kitchen ASAP so you can be nomming on these super fudgy, dark Double Chocolate Chunk Cookies as soon as you can. You won’t regret it :) enjoy! Beat together the coconut oil and coconut sugar until smooth. Add the egg or flax egg and vanilla and mix until smooth. Add the cocoa powder, almond flour, salt, and baking soda to the wet ingredients. Mix until well incorporated. Fold in the chopped chocolate and walnuts. Cover with plastic wrap and refrigerate for at least an hour (can prepare up to 48 hours ahead of time). When you're ready to bake, preheat the oven to 350ºF. Use a cookie scoop to form cookies and place on a parchment lined baking sheet; press down slightly. Sprinkle with flaky sea salt if desired. Bake for 10 minutes or just set around the edges. Recipe total time does not include time needed to chill the dough. Thanks for the cookie love, Casey! Looks goooood! Just one question: is it possible to use coconut flour instead of almond’s? Thanks for this marvelous recipe. Hi Rebecca, no unfortunately coconut flour should only be used in recipes that specifically call for it, because it is much more absorbent than other flours and will make things very crumbly. Hi Rachel, is it possible to substitute almond flour for a different GF flour? I’ve never tested these with anything but almond flour, but I’d go for a gluten free flour mix if you were to try it! Enjoy. Really delicious cookies, taste as good as non gf. ones I used to make, thanks! So thrilled to hear you enjoyed them! Thanks for the feedback, Rita. These look so fantastic! I just discovered you and after making your paleo chocolate chip cookies I am hooked! Amazing recipes. Question…do you know of any paleo chocolate options to be used in this recipe? I’ve been using regular dark chocolate but would love a recommendation! Hi Sarah! My favorite paleo dark chocolate for baking and eating is from Santa Barbara Chocolate – it’s coconut sugar sweetened and so delicious. Here’s a link and you can use the code BAKERITA for $10 off. Just want to say thanks for this recipe! I made a double batch for 2 xmas parties and they were a big hit at both gatherings. They disappeared in a flash — I couldn’t believe it. People who ate nothing else on the buffet table took these cookies! I made a few very slight changes — for cocoa powder, I used Dutch process cocoa powder and for sugar I used Muscovado sugar. I know that is not really Paleo, but I wanted them to be special. Also used pecans in one batch when I ran out of walnuts — both equally good. I just have a question — why do you call for the dough to be chilled? I did do that, and the dough was quite firm — it took a bit of force to get the knobs of dough into the cookie scoop, but it was okay. The dough was pretty firm before it went into the fridge — so why chill it? Does it improve the texture somehow? Hi Donna, so glad to hear you loved the cookies and that they were such a success! I like to chill cookie dough because it helps the flavors to meld nicely and give a nice puffy cookie that doesn’t spread too much. If it works for you without chilling though, go for it! YAAAAS-the more chocolate the better!!! Made these cookies (vegan version) and they were amazing! So chocolatey and the taste, texture and chocolate chips were perfect! Deffo making again, thanks so much!